Rodney Butler and Kevin Brown, the tribal chairmen. East Windsor officials assured legislators their police force of 26 and community of 11,400 is ready to host a commercial casino jointly run by the state’s two federally recognized tribes. A lawyer for a competing casino insisted the state and town struck a bad bargain. The state’s Catholic bishops registered their opposition to any gambling expansion. 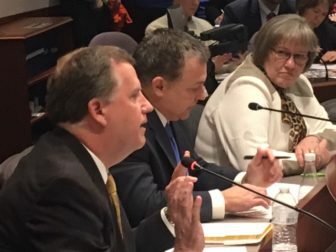 Rep. Daniel S. Rovero, D-Killingly, who listened to it all Thursday as a member of the legislature’s Public Safety and Security Committee, said he arrived in Hartford seeking clarity on the risks and benefits of granting the tribal owners of Foxwoods and Mohegan Sun the right to jointly develop a casino off tribal lands without considering other bidders. He left disappointed, unsure if the state was getting a good deal, if the enterprise would pass muster with the Bureau of Indian Affairs, if the existing revenue sharing deal would be jeopardized, if MGM Resorts International might convince a court that a no-bid process violated the equal protection clause of the U.S. Constitution. He is unlikely to get one. Sen. Timothy Larson accusing MGM of insulting East Windsor. 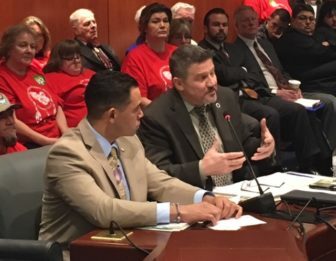 The public safety committee is expected to vote Tuesday on two bills: one granting the Mashantucket Pequot and Mohegan tribal nations permission to open a casino in East Windsor to compete with MGM Springfield; the other would open the state to competitive offers by other gaming concerns. A new wrinkle emerged: Sen. John Fonfara, D-Hartford, told CT Mirror the Finance, Revenue and Bonding Committee was developing its own bill to create an open process for gaming companies to seek legislative authorization to develop a casino. If other legislators share Rovero’s uncertainty, that is of benefit to MGM. The national resort and gaming company is trying to stop the tribes from opening a casino on the site of an old cineplex off I-91 in East Windsor, a short ride from Springfield, where MGM is opening a downtown casino in 2018. Rovero complained during the hearing and in an interview that nearly every scrap of information about the state’s first major expansion of casino gambling since Mohegan Sun opened more than two decades ago has come from consultants hired by the tribes with a vested interested in a new casino or a competitor intent on stopping it. The administration of Gov. Dannel P. Malloy has kept to the sidelines, other than requesting a formal legal opinion from Attorney General George Jepsen on the legal risks. Jepsen, whose legal concerns killed the tribes’ first try for authorization in 2015, is expected to deliver his opinion no later than Monday, before the public safety committee vote. One difference this year is the tribes are back with a site and a supportive host community, a small town chosen for its locale roughly halfway between Hartford and Springfield and its proximity to I-91 — just “20 car lengths,” is how the local selectman put it. “It’s certainly not an uphill battle. It’s an educational process,” said Rodney Butler, chairman of the Mashantucket Pequot Tribal Nation. MGM produced an opinion from Kenneth Salazar, a former Democratic U.S. senator and Colorado attorney general who oversaw the Bureau of Indian Affairs as interior secretary for five years during the Obama administration. He warned that the BIA would have to review not only the East Windsor deal, but the existing agreements that call for sharing 25 percent of slots revenue with the state. He said the BIA might reject the 25 percent share as too generous — as it has in other states. The tribes countered Thursday with their own expert: George T. Skibine, the former interim chair of the National Indian Gaming Commission. 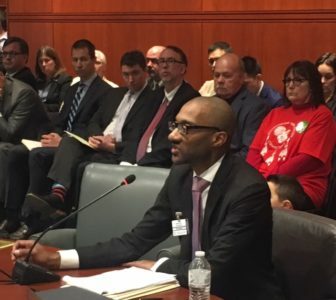 He told the legislators that Salazar was wrong: the BIA was unlikely to void the revenue sharing deal that produced $262 million for Connecticut last year. “I’m really confused,” Rovero said. One committee member who was certain about the value of a no-bid deal with the tribes was Sen. Timothy Larson, D-East Hartford, co-chair of the committee. His district includes East Windsor, and he ferociously attacked Uri Clinton of MGM for daring to question whether the town made the right decision. Larson waved a brochure MGM mailed to residents in East Windsor that criticize the town for not submitting the proposal to a town-wide referendum, calling it an effort to derail an economic deal that it is “at the five-yard line.” He complained of phone calls MGM made, sowing doubts. Clinton said no insult was intended, but he stood by MGM’s insistence that the town and state could obtain a better deal with an open competition. The tribes would pay the state 25 percent of its gross revenues from slots and table games. It would pay East Windsor a $3 million fee and $5 million in property taxes. Larson, who said he had another meeting to attend, walked out while Clinton was speaking, leaving some spectators grumbling he was rude. The hearing room was packed with backers of the tribes and MGM. The casino company has bankrolled the Schaghticoke tribe, whose chief testified in support of an open competitive process. How the Schaghticokes would benefit was unclear. The tribe is not federally recognized and has no rights develop a casino under the Indian Gaming Regulatory Act. If the state solicited proposals for a commercial casino, gaming companies could bid without an alliance with a local tribe. MGM’s deal with Springfield bars it from opening another casino within 50 miles of the city, prompting Larson to say the company had only one interest in an open competition: The ability to make a bid to develop a casino in Fairfield County, close to the New York City market.